Description of "ROLE OF WOMEN LABOUR IN BRICKS INDUSTRIES (eBook)"
The economy of Assam is predominately rural and agriculture is the most dominant acting in the rural economy. But somehow some small scale industries, large scale industries or tiny industries have risen for providing employment to the rural or urban people. Access to basic needs of the poor the Bricks industries of Bilasipara town is one of the bigger challenges faced by the poor women for their socio economic development. Women labour plays a critical role in bringing the Bricks Industries as a rising industries of Bilasipara town. These industries service within the reach of the underserved and the poor women who are otherwise excluded from the mainstream financial sector to be a powerful in fight against unemployment and poverty. Chafikhur Rahman was born on 3rd Februaru' 1986 at village - Nazirakhat, P.O. - Tepesia, District- Kamrup (Metro), Assam, India, Pin 782402. His parents are Abdul Malik and Nilima Khatun. Mainul Ali and Aifun Nasa Begum are brother and sister. He completed his primary education from Nazirakhat L. P. School. He passed HSLC in 2002 with 1st Division later in Mathematics. In 2004, he passed HS later in Economics and Logic & Philosophy & BA passed in 2nd Class with major in Economics in 2007 from Sonapur College. Then he went to Pune and MA completed from Poona College in 2009 with 1st Class Distinction. He completed PGDCA in 2013. He joined in Directorate of Census Operations, Assam as a Statistical Investigator and continuing it. Before this, he temporarily joined in Sonapur College to teach Economics in August – October’ 2009. He married to Rumani Islam on 12th May, 2013. The author starts to write from Class VI. The 1st writing of the author was a short story ‘SOHAY’ (Help) which was published in the year 1999 in Assamese daily ‘DOINIK ASSAM’, when he was in Class VIII. 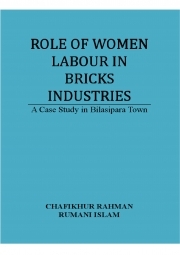 Reviews of "ROLE OF WOMEN LABOUR IN BRICKS INDUSTRIES (eBook)"